Today’s card is Heru Wer (Horus the Elder), a very ancient god of Egypt that stood for the sun in it’s wisdom. 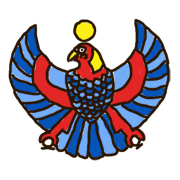 Heru (which means ‘falcon’) is the king of the day time sky where he flies high to see everything everywhere. Heru Wer is from a dynasty before Ausar (Osiris), making him of an earlier time. Heru Wer is like the Mage in the tarot deck, not only because of his knowledge, but also his wisdom. Heru Wer is here to tell you that you have many teachers around you. They are not all older than you, but have experience and wisdom in the ways you need guidance. Ask for this wisdom and open your eyes to see the teachers God sends you. Never forget that you should give back by being a teacher yourself to someone new.